A Spanish rescue ship patrolling the Mediterranean Sea said Friday that Italian officials told it to let the Libyan Coast Guard respond to a distress call from a smuggling boat carrying scores of migrants, only to hear reports shortly afterward that 100 migrants were missing and feared dead in the same area. The account by Proactiva Open Arms came as EU leaders in Brussels signed a deal aimed at controlling migration that steps up support for the Libyan Coast Guard and demands that humanitarian and other ships operating in the Mediterranean not obstruct their operations. The moves are part of efforts to stop smugglers from operating out of the lawless North African nation. Open Arms founder Oscar Camps said such demands will cost the lives of people at sea. "The problem is there won't be anyone to witness this and denounce it, that is what will happen, starting now," Camps said. In the latest incident, the Open Arms crew intercepted a radio transmission about 8 a.m. on Friday between European military officials and the Libyan Coast Guard giving details of a rubber boat in distress at least 100 migrants onboard, said the Open Arms head of mission, Ricardo Canardo. But an official distress signal was only received by boats in the region on the Navtext navigation system 90 minutes later. 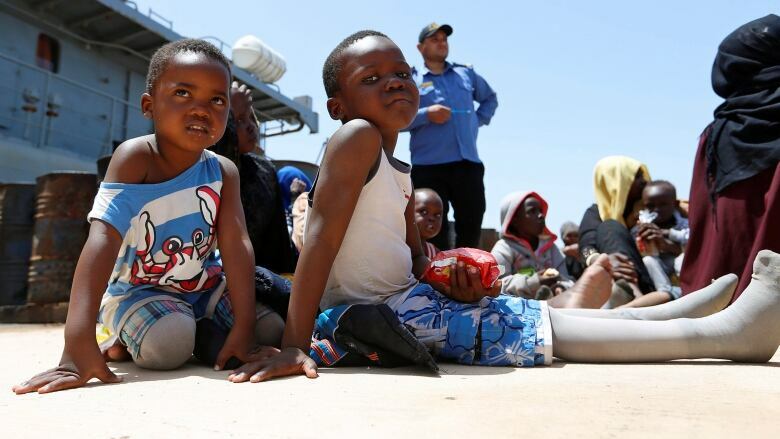 When Open Arms called the Maritime Rescue Co-ordination Centre in Rome to offer help, officials there said the Libyan Coast Guard had the situation covered and that no assistance was needed. "We suspect it is the same people," Canardo said. The Libyan Coast Guard said they rescued 16 migrants from the boat that capsized east of Tripoli but about 100 on board were missing at sea and feared dead. A survivor spoke of 125 people on board, including women and children. Riccardo Gatti, captain of another Proactiva ship, the Astral, said he has witnessed tragic rescues performed by the Libyan coast guard, which lacks the most basic equipment, including life vests. Not only has the Libyan coast guard never answered their co-ordination centre phones when called by Proactiva, Gatti said they have more than once aggressively told Open Arms and Astral to leave in the middle of a rescue. He said that included one incident when they shot into the air and jumped into dinghies to try to take away migrants, and another time boarding the Open Arms rescue ship with guns threatening the crew. "For months now, [the Libyan Coast Guard] has been presented as an official body, formal, very well-trained and legal, and these are the same people who have shot at us, who have kidnapped us," Gatti said. "All of this is theatre." The Astral left Malta early Thursday with four European parliamentarians on board as observers to join Open Arms. However, the boat is unlikely to be able to return to Malta, as the EU island nation close to Libya has closed its ports to humanitarian ships as it investigates a private German rescue mission accused of allegedly violating maritime law. Italy on Friday issued an order barring the Astral from its ports, citing public security. The Open Arms has already been denied a request to dock in Malta to resupply, and a similar request to Italy has not been answered. Gatti questioned the reason for his ship's ban, noting the Astral had made no such resupply request. He said humanitarian groups are being targeted by governments for rescuing people who face dire circumstances. "They say that we are the criminals [for the sea rescues] — but they are the criminals that let 100 people die this morning," Gatti said.